The last time I saw a movie called Godzilla on a big screen it was 1998, the evening before its official release date. Two hours later I asked Chuck Buckley, my fellow columnist at Elon's newspaper The Pendulum, what he thought of it. "I thought it sucked! ", Chuck replied. ...and the worst Godzilla ever. No, nevermind. That wasn't Godzilla. I don't know what that was. It was G.I.N.O: Godzilla In Name Only. That slithering sacrilege bore no resemblance whatsoever to the classic Toho's Toast of Tokyo. If only Dean Devlin and Roland Emmerich (who had previously given us Independence Day) had called their creature something other than Godzilla, I would have probably been forgiving and accepted it for what it was: a giant monster movie. But noooooooo... they promised us Godzilla, and instead we got a Fraud-zilla. I'm a huge fan of the original Godzilla, the original 1954 movie initially released as Gojira (absent the scenes with Raymond Burr) in Japan. To me Godzilla was never a giant monster movie. The original movie was meant to be a dead-serious film about nuclear warfare in the aftermath of the bombings of Hiroshima and Nagasaki. Godzilla was the result of man's incapacity to grasp the darker science he had unleashed upon the world. He was never meant to be "cute" or "cuddly" and he certainly isn't supposed to be an anthropomorphic "father figure" type (yeah I'm looking at you Minilla). Godzilla, to me, is not a character. He is a force of nature: the biblical Leviathan, fury personified. An entity beyond the means and devices of man. Godzilla, when he is best handled, simply is. And to date only two movies have given Godzilla the treatment he deserves: 1954's Godzilla and Godzilla 1985 (a film rife with problems but otherwise a fitting proper sequel to the original). And for as long as I can remember I've wondered if an American studio could produce a Godzilla motion picture that went back to the roots of what Godzilla is, and tap into that and give the King of the Monsters the appreciation and respect he demands. Well folks, I just came back from seeing Godzilla, the 2014 film and good googely moogely, they did it. They nailed it. This is at long last the modern take on Godzilla that I've wanted to behold for way too long. This is how you do Godzilla, people! By making him a force of nature as unstoppable as an earthquake or a hurricane. And the more I think about it, the more I'm growing in the opinion that this Godzilla movie is in many ways better than the very first Gojira (a film that will forever be among my favorites). It occurred to me that in the original movie Godzilla very nearly destroys Tokyo completely... but we're never given an explanation why he's doing it. That is not the case with Godzilla 2014. In this movie Godzilla destroys a lot more real estate, stretching all the way across the Pacific basin. And there is a very plausible and believable purpose behind his rampaging. It has to do with the MUTOs (Massive Unidentified Terrestrial Organisms) which have come out of hibernation, and which themselves are some of the gnarliest designs for giant monsters ever put on film. But you don't want to know about them as much as you do about the star of the show. This is Godzilla folks, in every conceivable aspect. But along with much of the rest of the movie, you shouldn't hear it all from me. Better to go in cold and behold Godzilla with your own eyes and take in what can only be described as the magnificence of this colossal beast. Effects wise, this could be described as practically a perfect movie. The effects blend in seamlessly with the characters and the story, without ever being overwhelming. The battles between Godzilla and the MUTOs are perhaps the biggest and most destructive ever depicted in a motion picture (and you thought that the fight between Superman and Zod in Man of Steel last year was something. Ooh-bruddah...). And just wait'll you see the HALO jump into the city. If you think you could jump from 30,000 feet into the midst of a ruined city being thrashed to pieces by monsters the size of ten city blocks, you are a better person than I. But all of this is for naught without a very human tale being told, as we watch all of these people caught up in the wrath of the titan. Ken Watanabe, always a great actor to watch, has a prominent part as a Japanese scientist named Serizawa (a nice homage to the 1954 original film). The main story focuses on Ford Brody (Aaron Taylor-Johnson), a U.S. Navy ordnance disposal officer trying to return to his family and see them to safety. But for me the standout performance belongs to Bryan Cranston as Joe Brody, Ford's father. In flashback we watch Joe lose his wife in a horrific accident: something which sends him into an obsessive spiral, incapable of moving forward with life. Cranston pours a heap of passion into the role and it makes a significant contribution to one of Godzilla 2014's biggest strengths: these are people, and we genuinely come to care for them. As I was entering the theater a man was exiting, talking on his cell phone and I overheard him say "it was the best Godzilla ever and I've been a Godzilla fan all my life". Leaving Godzilla 2014, I would have to say the very same thing. 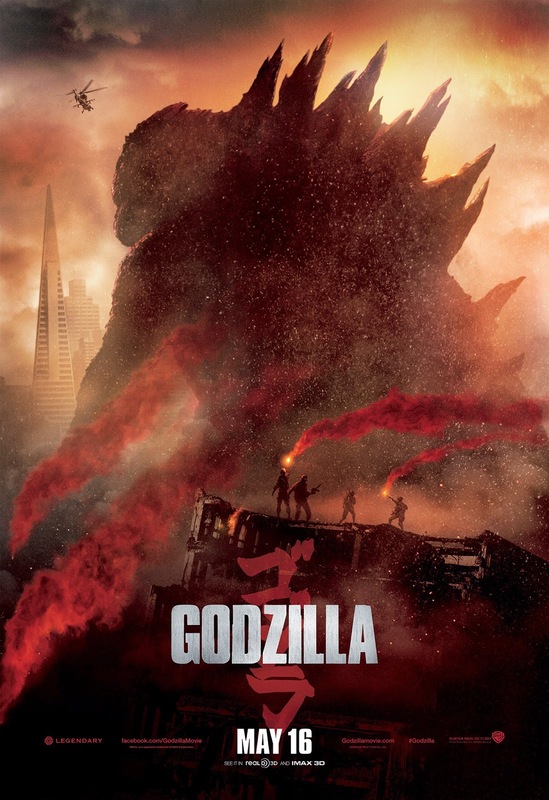 It is absolutely the best Godzilla film yet brought to the screen in the entire sixty years of the franchise, and director Gareth Edwards and his crew deserve the highest accolades for giving the big green guy the respect due him. I'm looking forward to seeing it again with friends this coming week: not just to enjoy it once more but to see the looks of awe, shock and delight on their faces. Godzilla 2014 gets this blogger's highest recommendation. It's absolutely worth catching in first run (and I'm looking forward to watching it in IMAX soon).